Eunice Marie Giroir Zimmerman born February 1, 1926, passed away at The Sanctuary at Passages Hospice on Monday, January 28, 2019 at the age of 92 years. Beloved wife of 60 years to the late Charles Clement “Charlie” Zimmerman, Sr. Daughter of the late Edgar Giroir and Ursula Michel Giroir. 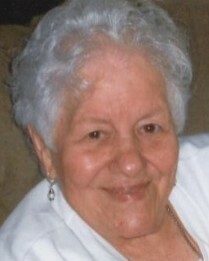 Beloved mother/mother-in law of Charles “Chuck” Zimmerman, Jr. (Kelley), George Zimmerman (Faye), David Zimmerman (Arlene), Richard Zimmerman (Jody), William “Bill” Zimmerman (Susie), Charlotte Zimmerman Voss (Dennis), Nancy Zimmerman Schneider (Dennis), the late Trudy Zimmerman Ali (John). Also survived by 18 grandchildren and 25 great grandchildren. Sister of the late Edmund, Phillip, Mike, Roy, Louis, Edgar Giroir, Ondine “Deanie” Giroir Nowak and Lucy Giroir Lopez. She was a native of Paincourtville, Louisiana, grew up in New Orleans and resided in Metairie for 65 years. Eunice was a very spiritual woman dedicated to the Rosary and her Catholic faith. Her focus in life was God and family. Her sweet loving kindness will be sadly missed by all who knew and loved her. In lieu of flowers, MASSES will be appreciated. Family and Friends are invited to attend a Funeral Mass at Tharp-Sontheimer-Tharp Funeral Home, 1600 N. Causeway Blvd., Metairie, LA, on Friday, February 1, 2019 at 12:00 noon, visitation 10:00 a.m. until service. Interment in Cypress Grove Cemetery. Condolences may be expressed at www.tharpsontheimerfh.com. Information 835-2341.